Description: he Roquemaure village, 15 km from Avignon, on the right bank of the Rhône, is the link between Languedoc and Provence. In the 14th century, Roquemaure was the most important port on this section of the right bank of the Rhône. The collegiate church (Languedoc gothic style) of Saint Jean-Baptiste and Saint Jean l'Evangéliste , was built in 1329 on decision of the Bertrand cardinal of Pujet, nephew of the pope Jean XXII. It is well known, that the famous French "Minuit Chrétiens" song (Christian Midnight) , whose words were written by Placide Cappeau of Roquemaure, was interpreted for the first time on December 24, 1847 in this church . Since October 23, 1868, the church shelters the relics of Saint Valentine, "Patron des Amoureux", in order to protect the vineyards from phylloxera, which spread in France for the first time in 1864. The organ was built in 1690 by the Jullien brothers of Marseilles for the church of Cordeliers of Avignon. Being unknown during several centuries until 1965, an estimate was discovered on behalf of the Convent of Cordeliers in Avignon so that the identification could be made between this document and the instrument in Roquemaure. The former 1642 organ of Frères Eustaches, burned during the French revolution, was thus replaced by this one, which was undoubtedly sold in Avignon like national good and then bought by the fabric committee of Roquemaure. The invoice of this organ, whose certain elements are built on techniques of the Middle Ages, shows an instrument of a rare quality and nowadays is the object of famous studies of organists and schools of organ builders. It probably contains the most significant ensemble of original pipes of the 17th century and is classified as historic building (monument historique). Many recordings by master organists made it famous throughout the whole world. The decorated organ case with its two towers dates from the 18th century and contains the thousand pipes of this instrument. The conception and the voicing of this organ is very particular. 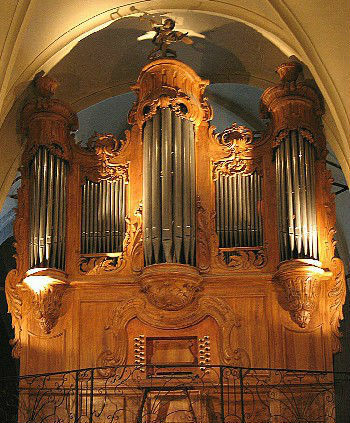 The organ structure is based on the Spanish style, having separate windchests for bass and treble with split manuals and a small pedal compass with only eight tones. The "Tierce" has a special narrow measure, that will be found very rarely in French organs of the 18th century. The pipes, in rolled metal of Italian style, are very well preserved. Very powerful and characteristic reed stops with excellent blending especially enable playing French as well as Spanish and even Italian baroque music. The organ was restored by Atelier de Facture d'Orgues, Pascal Quiorin in 1988-89, the organ case was restored by the Férignac company. The instrument is in a very good shape. The organ was recorded an processed in Oct./Nov. 2004 with 44.1 kHz, 16 bit, multi-channel, for the upcoming Hauptwerk 2 features, using the multi-layer release introduced by OrganArt. All stops were recorded with multiple release levels for short and long key attacks for optimal acoustical mapping. Actually the sample set only is available in HW1 format (no multiple releases implemented), HW3/4 format will be published.